Just beyond the Sisters Mirror Lake was The House Rock, around which the trail curved to the east and then entered the Wickiup Plains, a large barren field of pumice and cinders. Decades ago, Native Americans came to this area to participate in ceremonies and the level terrain of the field would be filled with the temporary shelters or wickiups the Indians would build. After days of walking through the green canopy, it was marvelous to be in open country and to actually see and observe the features of the landscape as they glided by. Up ahead, Le Conte Crater sat at the base of a jumbled heap of lava appropriately named Rock Mesa, which at one time was a massive flow of slow-moving lava that was extruded from side vents of the South Sister volcano approximately two thousand years ago. For me, one of the most interesting geological features of the Sisters’ corridor is the black obsidian found around Obsidian Falls and Obsidian Creek just above the falls. Obsidian is nature’s own glass and is only found in areas associated with volcanic activity. Obsidian can’t really be classified as rock, it’s - well, it’s glass and highly prized by Native Americans for its usefulness in making tools, i.e., arrowheads, spear points, and cutting tools. Obsidian has trace elements in it that are unique to each volcanic location and act like a miniature GPS unit, thereby allowing a chunk of glass, or a finished razor-sharp cutting tool to be tracked over long distances when the item was used in trade. Not far from McKenzie Pass, the trail builders were forced to construct the trail through a jumbled heap of jagged lava that was spewed forth from Collier’s Cone, a side vent of the North Sister volcano. Putting the trail through this rugged landscape could not have been an easy feat. This part of the trail was laid out by Dee Wright and Ralph Engels, U.S. Forest Service District Ranger. When they found the pass through this labyrinth of jumbled rock, almost as if reading each other’s mind, they gave it the unusual name of Opie Dilldock, after a cartoon character from the early 1900s, who was known for finding his way out of difficult situations. Although it didn’t start out that way, part of the lure of the trail for me is the fascination I have for the methods the trail builders have used in gouging out the trail through solid rock, bridging marshy bogs, pushing switchbacks up sand hills, and cutting a trail through lava beds. It’s one thing to use explosives to blast a trail through solid granite, but it’s a different ball game laying a trail across sharp lava rock with large gaping holes between boulders that have to be filled with smaller rock, then further filled with sand and gravel to form a level tread that can be walked on without slicing open a hiker’s feet, shoes, and boots. By noon, I had reached Highway 242, a.k.a., McKenzie Pass. The exit onto the highway was not what I expected. Heretofore, when crossing a highway or Forest Service road, I would exit out of a grove of tall conifers, cross the road, and head back into the forest. No trees this time; in fact, there were no trees whatsoever to be found on either side of the road. Rather, the landscape on either side of McKenzie Pass was nothing but flesh-eating, black lava rock that looked exactly like the clinkers that came out the backside of a coal-burning stove. Not only was lava nasty-looking stuff, it was something one would never want to trip and fall into. Multiple razor-sharp edges protruded at every angle possible, even from the smallest lava boulder just waiting to rip apart the flesh from hiker’s hands, legs, even a face should the hiker be unlucky enough to do a face plant. For the most part, the McKenzie Pass Highway followed along the same route as the original 1860’s wagon road, which before then was simply an Indian path through the lava beds. I was supposed to meet my wife and daughter here, but I didn’t see any sign of my wife’s robin-egg blue Toyota Camry, so rather than wait at the road crossing, I walked a few hundred yards to the Dee Wright Observatory, and decided to wait there in the parking lot. Samba and Tallywa showed up and were greeted by Tallywa’s parents who had been waiting for them. The parents were going to spend a couple of days with Tallywa and her companion, Samba, in Bend. Inasmuch as there was no cell phone reception along McKenzie Pass, I asked Tallywa’s mother if she would place a call to my wife once she had cell phone service farther down the pass heading towards Bend, to let her know I was waiting for her at the observatory. She said she would. Before they left, I asked Samba how their meal at Elk’s Resort turned out. He said it was good, and not that expensive. While I waited for Jodie, I opened a bag of trail mix and began feeding the chipmunks. They were a hoot to watch as they stuffed their cheeks full of food, run off somewhere to deposit it, and then come back for more. The Wickiup Planes, where Native Americans would erect their temporary shelters during their annual stay in the area. I believe this is the Middle Sister. A huge chunk of obsidian, from which numerous tools could be made by Native Americans. The ground around this area was littered with obsidian chippings, the residue of individuals such tools. Beautiful and scenic Obsidian Falls. This is the quiet and bubbling stream that flows over Obsidian Falls. The Three Sisters are ancient volcanoes. They and their nearby cousins produced a lot a lava flows. The trail builders had to build a trail through this nasty stuff. Any fall onto these sharp and jagged rocks would result in the loss of some flesh. Another view of the trail named Opie Dilldock. A side trail to the top of the cinder crater. Supposedly there is a small lake in the center of the crater. It took a lot of fill to make the trail through the porous lava beds. And before you know it, you've arrived at the McKenzie Pass Highway. 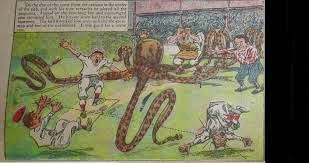 In this cartoon, Opie Dilldock is pictured in the red and white stripped shirt. He was noted for his ability to extricate himself from difficult situations.